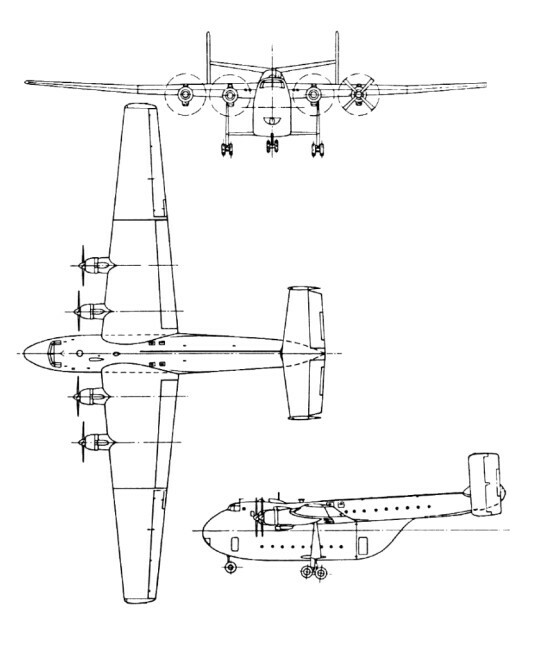 General Aircraft Ltd was asked to build a prototype of its submission for C.3/46; the aircraft was designated GAL-60 and based on the Hamilcar cargo glider built by General Aircraft, and named Universal Freighter in recognition of its civil and military potential. Work began at Feltham on the contracted prototype, and on a number of long-lead items for an anticipated second aircraft. During 1948, discussions between General Aircraft Ltd and the Humberside firm of Blackburns led to a merger of the two companies under the joint name of Blackburn & General Aircraft Ltd. The new company was formed on 1 January 1949 and it was proposed that all work in progress at the various factories be com-pleted as originally planned; assembly of the half-finished Universal prototype was therefore continued at Feltham and work proceeded normally until its completion in October of that year. Only then was decided that Hanworth Aerodrome adjoining the Feltharn premises - was totally unsuitable for the first flight of sue a massive aeroplane. As a result of this discovery, the whole thing was taken apart again and loaded on to lorries for the journey to Brough, where it was reassembled after considerable difficulty, and successfully flown as WF320 on 20 June 1950. The aircraft was a big one; 28 tons of metal built on almost architectural principles concealed a main freight hold 36ft long, 15.5ft high and 10ft wide. The forward hold - underneath the flight-deck - was 15ft long, with a headroom of nearly 7ft, and the tail-boom provided a rabbit-warren of individual compartments sloping down towards the main hold and punctuated by structural frames. The 162ft wing stood over 20ft from the ground and the tailplane span was 42ft. The single mainwheel tyres were over 6.5ft in diameter. The aircraft was designed for a rough field environment, and the possibility of battle damage had been considered from the outset. At any time it could be called away from a convenient airfield servicing unit and flown into primitive, and perhaps hostile, areas with minimal maintenance facilities. Everything had to be kept as simple as possible: no pressurisation, no pneumatics, no retractable undercarriage or fancy structural techniques that could fall apart under the considerable stress of rough-field operations at gross weights in excess of 100,000 lb. Part of Spec C.3/46 called for a service ceiling of 18,000ft. This led to discussions with the Engine Division of The Bristol Aeroplane Company which agreed to develop a special Hercules unit with a two-speed supercharger and other refinements that would push its take-off power to 2,040hp at 2,800rpm. The engines were mounted as self-contained, un-handed powerplants that were fully interchangeable, each driving a 14ft diameter Rotol constant-speed propeller with feathering and reverse pitch facilities. After the successful first flight, the com-pany's chief test pilot, 'Tim' Wood - who had originally been with General Aircraft Ltd - set about the initial handling trials with D. G. Brade as his co-pilot. The simplicity of construction and the overall soundness of the design, made it possible to complete all the essential clearances in 21 flights. The anticipated second prototype was ordered at the 1950 SBAC display, where WF320 had made every other exhibit look tiny. The new aircraft was to be sig-nificantly re-designed around four 2,850hp Bristol Centaurus engines: the rear fuselage shape would be altered to accom-modate removable clamshell doors and the tail-boom would be enlarged and structurally re-designed to provide seating for up to 42 passengers. At this time the manufacturers were still hopeful of civil sales and were quoting a fly-away price of just under £400,000. For nearly 18 months the first aircraft was used on a series of trials. The loading ramp and rear doors were removed, and the single mainwheels were replaced by four-wheel boogie units. Structural considerations prevented full modification of the tailboom but heavy dropping was done to look at possible load exit problems and aircraft trim changes during violent centre of gravity movement. Permission to go ahead with construction of the second machine was given during the Spring of 1952. Although the new aircraft amounted to a major re-design of the original Universal Freighter, it was completed in 15 months. Many of the heavy components that were made at Feltharn during 1948-49, particularly for the wing and centre fuselage - were virtually unchanged and could almost be used from stock, The Universal Mk2 (WZ889) made an uneventful first flight from Brough on 14 June 1953. 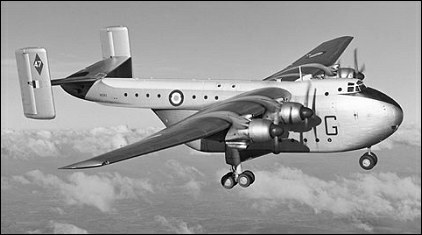 In September 1952 the Air Ministry, which was by then satisfied with the final re-design, gave approval for an initial batch of 20 for the RAF under the type name Beverley CMkl. Production began almost immediately, with work being shared between the company’s factories at Dumbarton and Brough. Most of the important sub-assemblies were manufactured at Dumbarton and then taken by road to the aircraft production line at Brough. By the time the first machine was recognisable as a Beverley under construction, the RAF's commitment to the type had jumped to 47. The second batch was ordered during May 1954 and it guaranteed continuous production until the summer of 1958. The first two production Beverleys (X13259 and XB260) were flown during January and March 1955: they were retained for some time as development machines, as were the second pair (XB261 and XB262), both of which were delivered to Boscombe Down in July 1955 for the usual acceptance, handling and flight limitations programme. Squadron life for the Beverley began on 12 March 1956, when XB265 was delivered to the Abingdon-based No 47 Squadron. By May 1958, three other squadrons (Nos 53, 30 and 84) had re-equipped with the aircraft, and a flight of four machines was attached to No 48 Squadron in Singapore. This flight was later to receive another aircraft and achieve full squadron status (as No 34 Squadron) in March 1959. The aircraft's withdrawal front the RAF took place in 1967-68 at the time of the RAF's acquisition of the Lockheed C-130K Hercules.